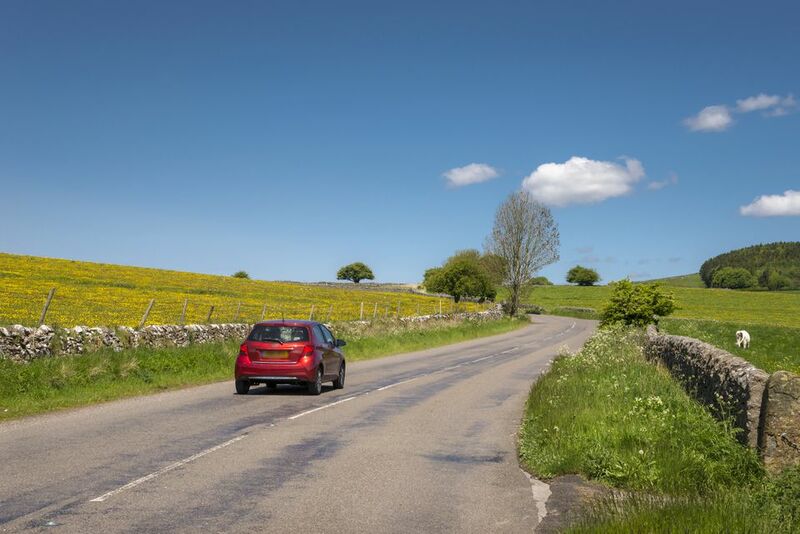 If you're a North American planning a road trip in the UK, you've probably already considered driving on the left and coming to grips with rented cars that have standard transmissions. But what's a zebra? How about a roundabout? Or a box junction? Understanding these ten terms and how to deal with them should help make your UK road trip a little bit easier. A lorry is a large, flatbed truck, covered or open, for carrying goods. The word was in use for certain kinds of freight-carrying rail cars long before motor vehicles were invented and it has been around since the early 19th century. Some dictionaries suggest it is related to the English dialect word "lurry" that means to pull, drag or lug - and that's been around since 1571!. To add to the confusion, all lorries are trucks...but not all trucks are lorries. Other kinds of vehicles that North Americans might call trucks all have their own special names in British English. To be classed as a lorry, the cab pulling the goods carrying part of the vehicle is always physically distinct and usually separate. If the cab can be physically separated from the rest of the vehicle, that vehicle is called an articulated lorry. The very large North American truck, often called a "semi", that pulls shipping containers or other large dry cargo containers on a flatbed fitted with wheels is an articulated lorry or sometimes, a juggernaut. If the part of the vehicle that contains the driver and the engine is all one with the goods carrying part, then it would be called a van. And if it carries liquid - like gasoline or milk - it's a tanker (not a tanker truck). Which One Can You Drive? If you are renting a big vehicle to carry stuff across the country, you will need a special drivers license if it's a lorry. If it's a van, your ordinary driver's license will be fine. A dual carriageway is a road that has a dividing strip of some kind between cars going in opposite directions - in other words, a divided highway. The divider can be anything from a metal or concrete barrier to a wide, median strip of grass. Usually, a dual carriageway has at least two lanes traveling in each direction. But not always; sometimes for safety reasons, a two-lane road - with one lane going in each direction - may be made into a dual carriageway. If you are about to enter a dual carriageway, a sign will usually warn you in advance. If the dual carriageway you are on is about to become a simple two-lane road, a sign that might look a bit like a tuning fork pointing downward will indicate that. And, as you have probably guessed, the "carriageways" of a dual carriageway are the lanes or roadways. "Carriageway" is an obsolete term that you won't see in many other contexts. If you decide to study for a British driving test to get a British driving license, you'll find the word "carriageway" in the UK Highway Code. Motorways are Britain's biggest, fastest limited access highways. They are comparable to the autobahns of Germany, the autoroutes of France and major North American Interstate roads such as the I-95 along the east coast. They are also similar to the turnpikes and thruways of the Northeast though they are, with one small exception, not toll roads. Motorways are indicated by a capital "M" before a number. For example, the M1, England's oldest, runs north from London to Leeds in South Yorkshire; the M6 crosses the West Midlands and the Northwest, to Gretna on the Scottish borders. "A" roads are the UK's older long-distance highways. Most, but not, all are limited access. They are similar to the old interstate systems in the USA such as US Route 66 or US Route 1. "A" roads that have been modernized to Motorway standards are designated with an M in parenthesis, like this: A14 (M). That means that Motorway speed limits apply.​ ​Usually, these are short stretches of older roads that have been widened and modernized in areas where there are no Motorways. Suffolk, for example, has several of these. A roundabout is a circular junction between several roads intended to keep traffic at busy junctions flowing more smoothly (not always successfully) then would be allowed by traffic lights. It is the same kind of traffic feature that would be called a traffic circle, or a rotary in different parts of the USA. Enter the roundabout bearing left and continue around it in a clockwise direction. This is exactly the opposite of what you would do on a US traffic circle, but don't worry, roundabout entrances are engineered so that you are guided in going in the correct direction. Give way to traffic coming from the right. That includes traffic entering from roads on the right or traffic already on the roundabout but approaching from the right. People - and SatNavs - often give roundabout directions by numbering the exits. So, you might be told to take the first exit from the roundabout. That will always be a left turn. Depending upon how many roads feed into the roundabout, a right turn could be anything from the third to the fifth exit. Whatever you do, don't panic. If you have to go around the roundabout more than once to be in the correct lane to exit, just go round again. Everybody does. The UK Department of Transport publishes a UK Highway Code with rules 184 to 190 dealing with how to cope with a roundabout. In residential areas, you may come across mini-roundabouts between relatively quiet residential streets. Sometimes they have cobblestone centers. These are for traffic calming and work like 4-way stops in the USA where you give priority to the driver on your right. In town centers, you may encounter double mini roundabouts, where one tiny traffic circle feeds directly into another. They are meant to control complicated intersections. Again, don't panic. Just treat each part of the double mini-roundabout as if it is an individual one, with the second little traffic circle simply being one of the exits off of the first one. A box junction is an intersection filled with crisscrossed yellow lines. It's a traffic calming measure that is meant to prevent gridlock in busy urban areas. Box junctions are almost always monitored by traffic cameras so it's wise to know the rules to avoid getting a ticket. When you reach an intersection - whether controlled by traffic lights or not - do not drive onto the crisscrossed area until the road beyond it is clear for you to enter. Blocking a box junction, especially when traffic lights change color, will earn you a stiff fine. There is only one condition in which you can stop in a box junction. If you are turning right, and your turn is blocked by oncoming traffic but the road you are aiming for is clear, you can wait in the box junction until you can make your turn. Confused? The UK Highway Code, Rule 174, explains it all - with pictures. A Zebra or Zebra Crossing is a pedestrian crossing. It is marked by white stripes painted across the road and orange globe lights, on polls, on the sidewalk at each end. Pedestrians always have the right of way on a Zebra, no ifs, ands or buts. Be aware when you are approaching one and be on the lookout for people crossing - your view could be blocked by the car or van next to you. You must remain stopped until the person has crossed the Zebra completely. And be on the lookout for pets crossing too. In small towns and places where pets may be allowed off their leashes, they get used to crossing at the Zebra with their owners and may head to one to cross by themselves. By the way, that's pronounced ZEH-bra, not ZEE-bra. No, it's not a place where cars go to play. It's a parking lot. And a multi-storey car park is, of course, a multi-level garage. You might wear one for the Easter Parade but in the UK, your car wears a bonnet every day. It's the hood. Useful to know if you want to check the oil or water on your rental car and you don't know how to open the hood. It's easier if you can ask a helpful passerby to show you how to "raise the bonnet." No, it's not one of those nasty yellow clamps that traffic police use to immobilize cars whose drivers have been naughty over parking fines. Although we do have those too. But a car boot is that place in the back of the car where you stow your stuff. In other words, the trunk. If you have a fender bender on the road and need to file an insurance claim or call for roadside assistance, it's useful to know the terms for the parts that give way first in minor accidents. Bumpers are still called bumpers but those the side bits, front and back aren't fenders in Britain; they are wings.